Robert Max Steckelberg (August 24, 2005) | Burmeister-Johannsen Funeral Home, Inc.
Robert Max Steckelberg, the son of Henry and Hattie (Schwieso) Steckelberg, was born on January 20, 1922, near Manilla, Iowa. He was baptized at the Lutheran church in Manilla and was confirmed at the Lutheran church in Arcadia, Iowa. He attended school through the ninth grade in Manilla. On October 20, 1943, Robert married Alice Christine Petersen at St. Paul’s Lutheran Church in Irwin, Iowa. The couple farmed near Irwin until their retirement in 1983, when they bought a home in Harlan, Iowa. Robert then worked part time for Farm Service Coop for 16 years. He also did lawn care and snow removal until February 1, 2000, when his health forced him to stop. 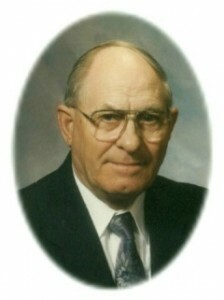 Robert was a member of St. Paul’s Lutheran Church in Irwin, where he served as treasurer and deacon for several years. He enjoyed collecting horse figurines and was known to be a hard worker. Robert M. Steckelberg died on Wednesday, August 24, 2005, at Myrtue Memorial Hospital in Harlan, Iowa, at the age of 83 years, 7 months, and 4 days. Preceding Robert in death were his parents; five brothers-in-law, LaVern Brue, Norman Petersen, Ralph Hendersen, Dale Myers, and Orville Petersen; and one sister-in-law, Betty Petersen. Survivors include his wife of 61 years, Alice Steckelberg of Harlan, Iowa; one son, Rickey (Pat) Steckelberg of Shenandoah, Iowa; one daughter, Rosemary (Alan) Klein of Kirkman, Iowa; one brother, Lester (Norma) Steckelberg of Greenfield, Iowa; two sisters, Lorene Brue of Manilla, Iowa, and Viola (Lester) Hass of Harlan, Iowa; five grandchildren, Brian (Jaime) Steckelberg of Kansas City, Missouri, Mark (Joanna) Klein of St. Anthony, Minnesota, Melissa (Mike) Wilson of Racine, Wisconsin, Jennifer Klein of Kirkman, Iowa, and Daniel (Dawn) Klein of Iowa City, Iowa; five great-grandchildren, Brenner Klein, Aubree Klein, Claire Wilson, Lauren Klein, and Olivia Steckelberg; two sisters-in-law, Lila Petersen of Irwin, Iowa, and Elsie Myers of Harlan, Iowa; two half-sisters-in-law, Anna (John) Caffery and Charlotte (David) Aten, both of Council Bluffs, Iowa; and many other relatives and friends. Funeral services were held on Saturday, August 27, 2005, at St. Paul’s Lutheran Church in Irwin, Iowa, with Pastor Victor Johnson officiating. Ruth Ann Barry served as the organist, and Milton Barry was the soloist. Casket bearers were Gilbert Hanson, Steve Petersen, Verle Greer, William Shannon, Donald Dahlof, Verl Arentson, Buck Armentrout, and Dallas Klindt. Burial was in the Oak Hill Cemetery in Irwin, Iowa. The Burmeister-Johannsen Funeral Home in Harlan was in charge of the arrangements.